Almost every review of the Nikon D5200 contains glowing reports about the camera’s picture quality. As you’ve no doubt discovered, those claims are true: This baby can create large, beautiful images. This figure illustrates the concept: The first example is a high-quality image, with clear details and smooth color transitions. The other examples show five common digital-image defects. Pixelation: When an image doesn’t have enough pixels (the colored tiles used to create digital images), details aren’t clear, and curved and diagonal lines appear jagged. The fix is to increase image resolution, which you do via the Image Size control. JPEG artifacts: The “parquet tile” texture and random color defects that mar the third image in the figure can occur in photos captured in the JPEG (jay-peg) file format, which is why these flaws are referred to as JPEG artifacts. This is the defect related to the Image Quality setting. Noise: This defect gives your image a speckled look, as shown in the lower-left example in the figure. Noise can occur with very long exposure times or when you choose a high ISO Sensitivity setting on your camera. Color cast: If your colors are seriously out of whack, as shown in the lower-middle example in the figure, try adjusting the camera’s White Balance setting. 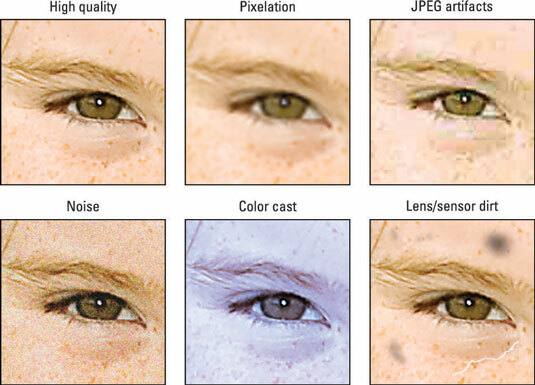 Lens/sensor dirt: A dirty lens is the first possible cause of the kind of defects you see in the last example in the figure. If cleaning your lens doesn’t solve the problem, dust or dirt may have made its way onto the camera’s image sensor. When diagnosing image problems, you may want to open the photos in Nikon ViewNX 2, the free photo software that ships with the camera, or some other photo program and zoom in for a close-up inspection. Some defects, especially pixelation and JPEG artifacts, have a similar appearance until you see them at a magnified view. With the exception of an unwanted color cast or a big blob of lens or sensor dirt, these defects may not even be noticeable unless you print or view your image at a very large size. And the subject matter of your image may camouflage some flaws; most people probably wouldn’t detect a little JPEG artifacting in a photograph of a densely wooded forest, for example.